Wood floors have their own charm, warmth and character. At times they can appear to be very durable, then one day scratches are noticed and no one seems to know why. Whether you have pets with claws or children with toys your wood floors can be safe with a few simple steps. Minimizing potential damage from furniture is easy and straight forward. The bottom of chairs, tables, wood items should have glides, preferably hard plastic. They have a single nail shank embedded into the plastic and are easy to install. Every once in a while turn a chair upside down and check the glide to see if it is getting worn. If so, replace it. Chrome glides were the standard prior to the development of plastic. They too will help protect a wood surface from scratches. However when they wear down, or become rusty, the three pronged kind can be harder to replace. Just as with furniture pieces, cleaning your floor regularly is a sure way to help with scratches. Small pieces of gravel or other hard substances can be so tiny you wouldn’t notice them until they left a mark. After a good cleaning, you can prepare to re-coat the floor with wood protecting oils or similar products. Remember, never wax or refinish the floor without first removing the old finish or you will have problems with the new coating sticking. 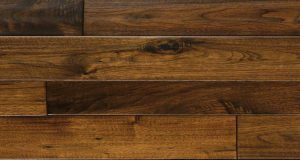 If you follow these simple steps, your wood floor is sure to last for years to come.